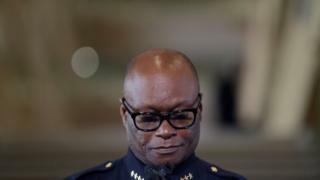 When five Dallas police officers were shot dead by a sniper on Thursday, it fell to David Brown, the city's police chief, to sum up the shock and grief of the force and the community. A black police chief who had worked diligently to improve community relations, and reduce the use of force, now had to confront a racially motivated attack by a young black man against his officers. "We're hurting. Our profession is hurting. Dallas officers are hurting. We are heartbroken," he said. He spoke on behalf of the Dallas Police Department, but his words echoed a personal statement he made six years earlier, in the wake of another Dallas police death. In June 2010, just weeks after he was sworn in as police chief, a young Dallas officer and father was shot dead on father's day. The killer was Mr Brown's 27-year-old son. "My family has not only lost a son, but a fellow police officer and a private citizen lost their lives at the hands of our son," he said. "That hurts so deeply I cannot adequately express the sadness I feel inside my heart." Mr Brown's son, David O'Neal Brown Jr, first shot dead a private citizen, Jeremy McMillan, as McMillan drove his family to his sister's house. He then shot police officer Craig Shaw, who was responding to the first shooting, more than a dozen times. Mr Brown took a leave of absence, according to local news reports from the time, and there was speculation that he would resign. It was not the first time he had suffered loss - in 1988, his former partner Walter Williams was killed in the line of duty. Three years later, his younger brother was shot dead by a drug dealer. But Mr Brown returned to work, determined to improve the Dallas Police Department's relations with the community. The department began to focus on de-escalation rather than force. Mr Brown placed emphasis on community policing and increasing transparency, even at the cost of clashing with department figures. He made enemies of the police unions by publicly sacking crooked officers, the Dallas Observer reported. He was told community policing was a waste of time. But by 2014, five years after his appointment, excessive force complaints against Dallas officers had fallen by 64%. "In my opinion, how can you argue with aggressive community policing if it has yielded the safest the city has been over 86 years?" he said in an interview with the Observer in February. Mr Brown's approach was visible on Thursday, in the hours before the gunman opened fire, as the police department's Twitter account posted pictures of officers posing with protesters and smiling. "Men, women, boys and girls gathered at Belo Garden Park for the demonstration re: recent police involved shootings," said one tweet. "Dallas police officers maintain traffic control to ensure the safety of the demonstrators," said another. In the aftermath of the attack, several reporters who cover the Dallas Police Department pointed out the irony that the gunman targeted a force which had made strides to break the cycle of violence between its officers and community. Speaking to the Observer in February, Mr Brown paid tribute to his officers and acknowledged the risks they took. "Over the last 12 years we've lost five cops in the line of duty," he said. "I mean, it's not just numbers on a page. It's sacrifice, and it's sacrifice at the highest level." Dallas Police Department equalled that 12-year sacrifice in a few short hours on Thursday. On Friday, Mr Brown reiterated his plea for mutual respect. "There are no words to describe the atrocity that occurred to our city," he said. "All I know is that this: This must stop, this divisiveness between our police and our citizens." What does the slogan 'Black Lives Matter' mean now?